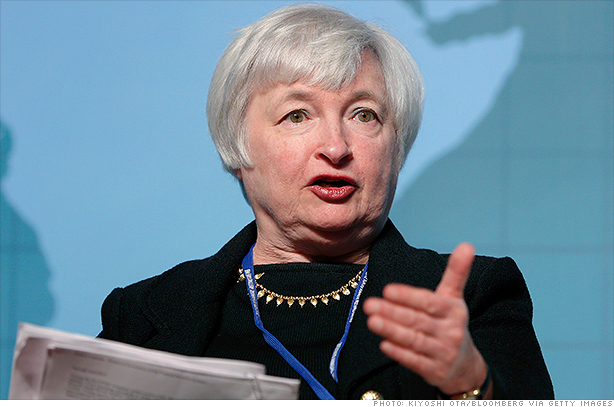 Donkeylicious: Will Janet Yellen Save Obama's Legacy? Like many people, I'm dissatisfied with the Fed's weak statements of support for economic recovery. I hope this is just a temporary phenomenon, though, as Ben Bernanke's term ends in February 2014. The front-runner to replace him seems to be Janet Yellen, the current Vice Chair at the Fed, who's widely rumored to be supportive of expansionary monetary policy. While it's possible that Republicans could block her like they've kept blocking Peter Diamond and lots of other appointments, they don't stand in the way of Fed Chair sized appointments. Moving a #2 Fed person to the #1 spot makes it extra hard to get in the way, too, as there's some sense in which nobody is more formally qualified. So it's just up to who Obama wants to nominate, and Dylan's 33% is a fairly cautious estimate of the probabilities. This may end up being the final legacy-defining decision of the Obama Admininstration, depending on how things go with Supreme Court vacancies and unexpected domestic and foreign crises. The next Fed Chair will serve for nearly the final 3 years of Obama's term, and will have the opportunity to lift the economy to a full recovery. It's very possible that Obama will leave office under continued high unemployment if we have only timid support from the Fed. But if Obama's second term ends with the Iraq and Afghanistan wars finished, and the economy good again, he'll have fixed the greatest disasters of the Bush Administration -- perhaps too slowly, but successfully.